Only two years ago, the future seemed bright for nuclear energy. But after the devastating 2011 tsunami in Japan, the world has experienced a sea change in attitudes toward sustainable power sources. Indeed, where nuclear power recently seemed to promise an answer to our global energy needs, natural gas now appears to hold the key. 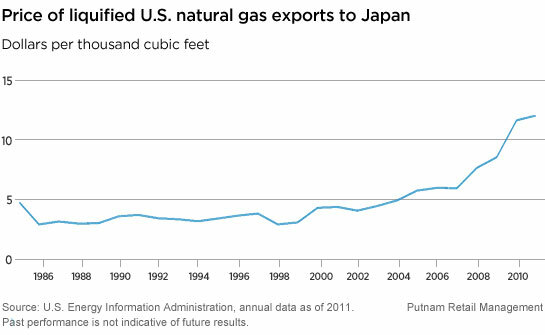 In post-tsunami Japan, natural gas — particularly liquefied natural gas (LNG) — is in much higher demand. China, meanwhile, is becoming more conscious of pollution as a byproduct of its rapid economic growth, and consequently is beginning to build more gas-fired electricity plants to fuel its industrial build-out and ongoing urbanization. Taken together, Japan’s and China’s increased reliance on natural gas has led to huge gas price increases in Asia. By contrast, natural gas is in relatively abundant supply in the United States, due in part to the success of new extraction technologies. Unfortunately for non-U.S. gas consumers, however, the United States is a self-contained market. At this point, it is not possible for U.S. producers to export much of their natural gas, and tradable LNG continues to be a scarce resource, with only modest new supply due to come on line in the next five years. It is no wonder, then, that LNG prices in Japan have risen rapidly in the past few years. This evolution of global energy markets leads us to see a number of attractive investment opportunities in natural-gas-related plays, especially in companies that have found new gas fields in both the United States and Asia.